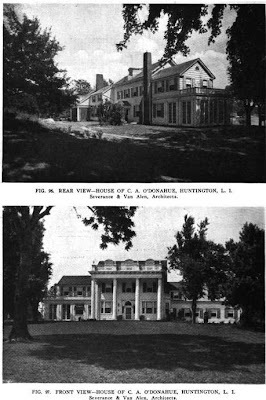 The residence of Charles A. O'Donohue designed by H. Craig Severance (of Severance & Schumm) c. 1917 in Huntington. 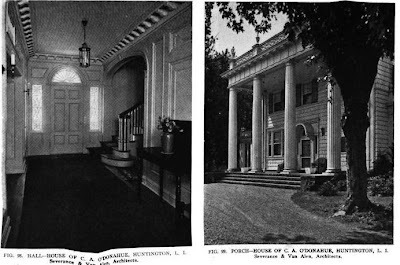 O'Donohue was a director of the Kings County Trust Company and the East River Savings Bank. Click HERE to see the O'Donohue residence on google earth. amazing that something like this survives and the great ones go. what were they thinking with those dormers? looks like my federal style farmhouse with the parthenon tacked loosely on the front. I live in the area and it's a lovely home and lovely people own it. If you don't have something nice to say don't say anything at all. I grew up in Huntington and I have always loved this home....I would gaze upon it as we boated out of Huntington Harbor. I always wondered who lived there and I actually was invited to a high party there in the early 1970's. It's always reminds me of my childhood in Huntington....great memories, great house!